Here are some of our recommendations for Things To Do In Bisbee, Arizona plus Lodging, Dining, History, Events, and lots of photographs. You will be amazed and delighted at how little Bisbee has changed since it's mining days. Colored Postcard of Bisbee, AZ circa 1905. Courtesy of Goose Flats Graphics & Publishing, Tombstone, AZ. Bisbee is a mining town, or was. Like many mining towns it is situated up against a steep hill. Walking the streets of Bisbee is a journey back to the late 19th and early 20th century. Just exploring the shops, restaurants, galleries, and other establishments housed in these fine old buildings is a pleasant way to spend a morning or afternoon. Take a Golf Cart Tour of the city. Much easier on the knees than walking and get a good dose of history to boot! There are also jeep tours of the historic district and mines. The primary historic district includes Main Street, Brewery Gulch, OK Street, Tombstone Canyon, and much of the surrounding hillsides. Bisbee has several fine art galleries and antique shops. A lot of folks go there just to people-watch. One might describe Bisbee’s hippy & biker inhabitants as “colorful”. The old saloons, such as St. Elmo’s along Brewery Gulch, are good places to make acquaintance with the indigenous population. I have generally found Bisbee-ites of all stripes to be friendly and helpful. 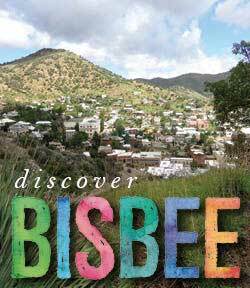 More than anything, Bisbee is a pleasant state of mind: laid-back, a little quirky, but with a definite sense of community. The people who live here really want to be here. Bisbee Mining & Historical Museum and Meet Pete on the Queen Mine Tour. Hotel San Ramon, wonderfully restored, excellent service and attention to detail. Arizona & Calumet Guesthouse B&B This is a fine Bed & Breakfast located in the Warren District two miles south of Old Town Bisbee. In this video you will meet Joy Timbers, the proprietor. The Eldorado is 12 roomy suites located on OK Street. The front suites overlook Brewery Gulch. Very comfortable. Inn at Castle Rock and Hazel's Table 10 Private Dining. As quirky as the town itself. A fun experience. The Copper City Inn is a fine "new" addition to the Bisbee Hotel group. See the Review. Other Bisbee Lodging Reviews You May Find Useful. Here is a page and a map to all of our Lodging Reviews! The Bar at Santiago's Mexican Restauant, Bisbee. Bisbee has some of the best restaurants in all of Southern Arizona. Of the 9 Southern Arizona Restaurants that we rate 5-Saguaro (Best of the Best), three are in Bisbee. For our Bisbee Dining Reviews, click Here. The Bisbee Massacre is about a robbery in 1883 that went bad ... real bad. For other stories of Bisbee's History visit here. Bisbee is extremely photogenic. Take your camera and see what compelling images you can capture. See our slideshows below. Going Back to Bisbee by Richard Shelton. It is the story of a professor's trip back to Bisbee after many years. Scenic and memorable, if you know Cochise County, you will recognize many places.